Once you’ve chosen the right cabinets for your kitchen, you still need to find the right knobs and pulls to go with them. This sounds easy, but there are a lot of options out there. There is no right and wrong way to choose the hardware for your kitchen cabinets, but it helps to be able to narrow down your options before you begin the installation. With that being said, here are just five kinds of hardware that can be installed in your new kitchen cabinets. If you have traditional shaker cabinets in your kitchen, knobs and pulls made from either nickel and steel are a great option. They work well if you want to add a retro look to your kitchen, but they are neutral enough to fit in with a more modern space as well. They’re also great if you have cabinets with exposed hinges, and the fit well with modern industrial lighting. If you want to add an art deco touch to more modern cabinetry, you can install streamlined moderne pulls and handles in your kitchen. These long and elegantly curved pulls usually come in stainless steel and look great with dark stained wood. They’re also very easy to grip, which gives them a distinct advantage over more shallow pulls. The only problem is that they are more expensive than shallower pulls, if only because they are so much larger. Much like streamline moderne pulls, bar pulls are very easy to grip. They resemble long railings that can extend the length of a drawer, although there are no rules for how long a bar pull should be. Bar pulls are usually made from stainless steel, but you can find some that are made from polished brass or satin nickel instead. They look great in modern kitchens, and they’re good for people who are elderly or disabled since they’re so easy to grip. If you prefer a more minimalist style for your kitchen, you can always opt for having “invisible” hardware for your cabinets. These include pulls that are integrated into the cabinet doors, push latches that allow cabinet doors to spring open by pushing on them, and edge pulls that are hidden in the top edges of the doors. These options are great if you want a sleek and more streamlined look to your kitchen, but they might not be a great idea if you need to have an easy-to-grip handle for your cabinets and drawers. Window sash pulls resemble window sash fittings that were popular in homes during the early 1900s. They’re great if you want to give your kitchen a more old fashioned look, and they come in a variety of looks and finishes. You can find window sash pulls in brass, nickel, wrought iron, or just about any material. This is just a handful of options to choose from. There is no right or wrong way to choose cabinet hardware for your kitchen, as long as it matches the rest of your decor. 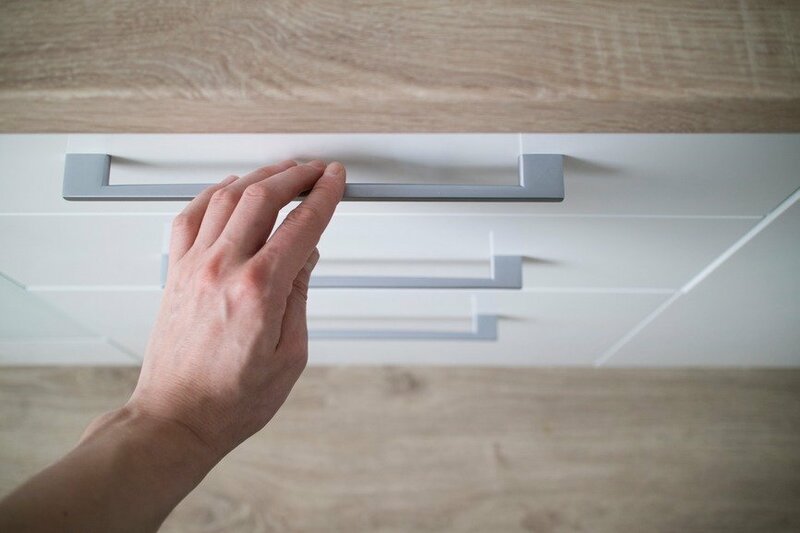 If you have any questions about installing kitchen cabinet hardware in your home, contact Kowalske Kitchen & Bath for more information or for an estimate.